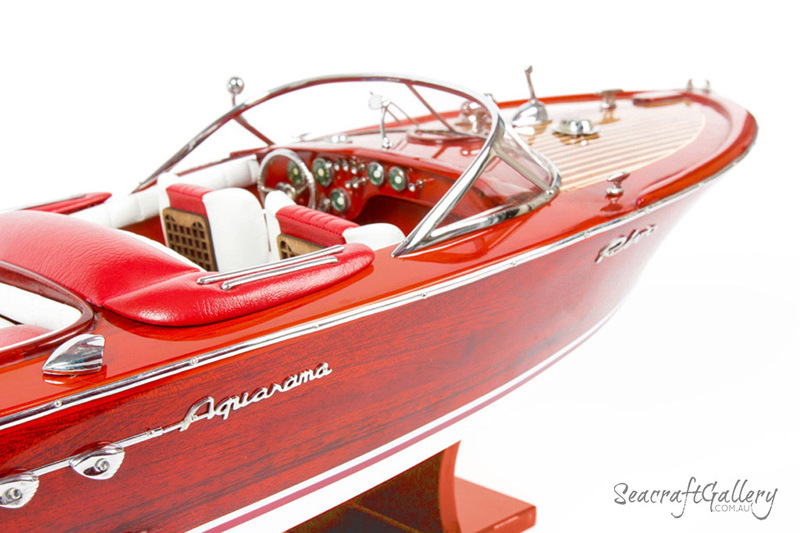 When looking at handcrafted wooden boat models to create the right atmosphere in your office, the Riva Aquarma might just catch your eye. This boat is a fine example of rich European eloquence and elegance. Easily among the crown jewels designed by the famous Carlo Riva, it’s become a legend in many respects. 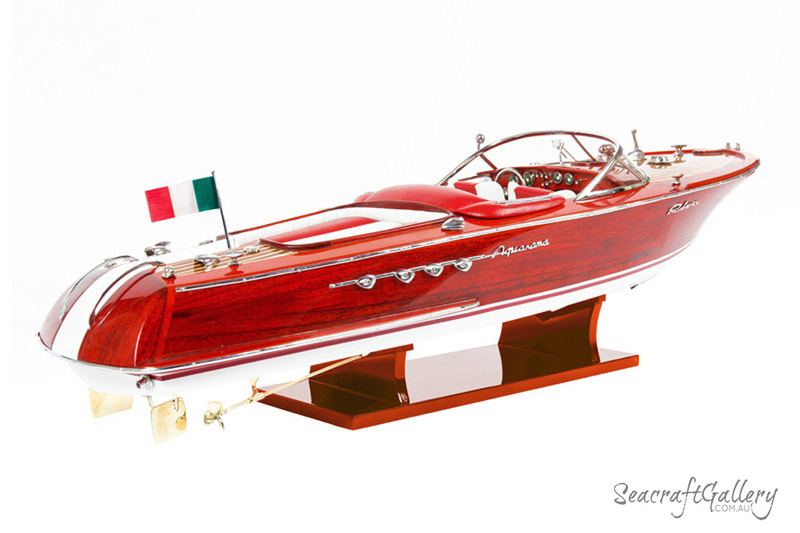 It’s a boat that comes with a classic Italian feel to it, having become a legendary boat on the various seas, waters and coasts of Europe. She’s not only a stunning piece of maritime history, but also a boat that truly stands out due to her striking, all-red design. They were a vintage breed of boat, created from 1962-1996. Today, though, they are seen as one of the perfect examples of what a runabout should be. 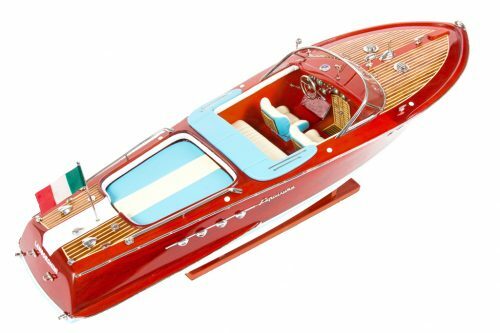 Our 70cm Riva Aquarama model boat is a fine example of what this kind of boat should represent. Every effort has gone into capturing the luxury of the Riva itself, ensuring this boat model can carry on the legacy of the famous Riva Trittone. 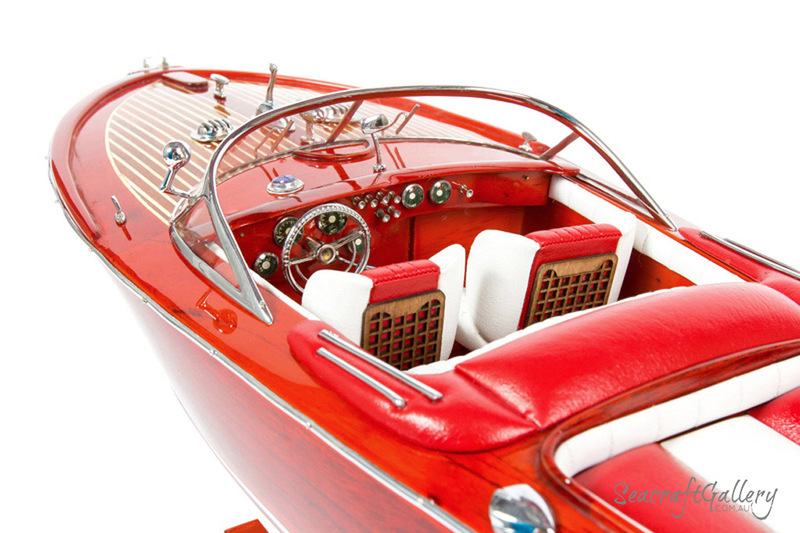 Perfect for board rooms and for model boat enthusiasts, this is a must-have for those who love classic, powerful speedboats! Handcrafted, fully assembled and ready to put on display as soon as it arrives. 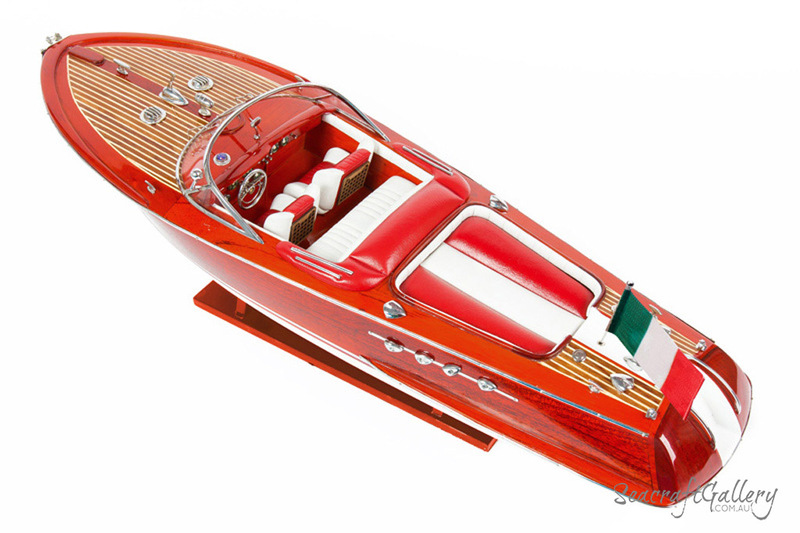 A recreation model boat of the Riva Aquarma in its most detailed form yet. Plank-on-frame construction used, with individual wood strips applied on the hull. Polished, smoothened finish with numerous paint and varnish layers used. Brass and steel fittings are used throughout – no plastic is present. Fittings and features such as leather seats are included – as is the Italian flag. Accurate attention to detail helps to create the Riva Aquarma as it is. Based on real drawings and copies of the plans for the Riva Aquarma as well as photos. Comes with a strong wooden base to allow the boy to be easily presented and shown off. Also perfectly suitable for storage in one of our many display cases: ask for more details. 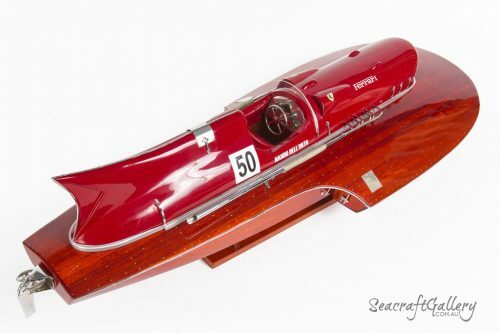 A perfect choice for anyone who loves to collect model boats or wants a centrepiece. 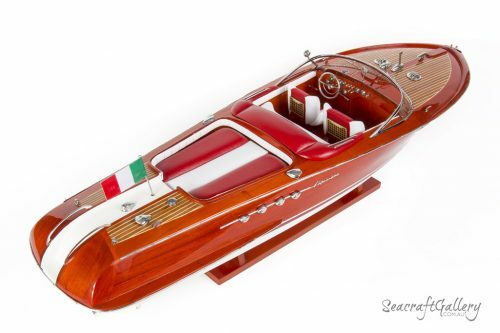 Riva Aquarama model boats are also available in other sizes 50cm and 90cm. 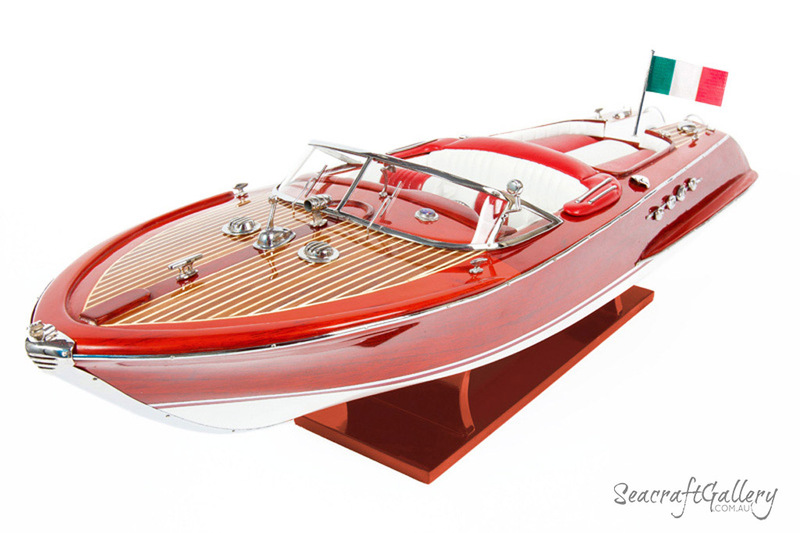 It’s safe to say the Riva Aquarma is one of the most important designs put together by the famous Carlo Riva. The name of the boat itself actually takes some cues from the Cinerama movie formats that were so popular when it was first introduced in the mid-1960s. 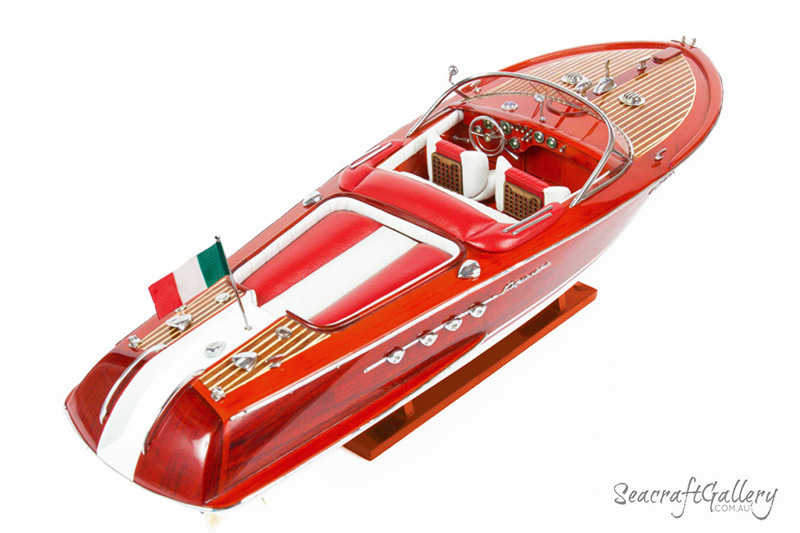 Inspired by the old Riva Trittone, this was a boat that combined pace and beauty into one superb boat model. 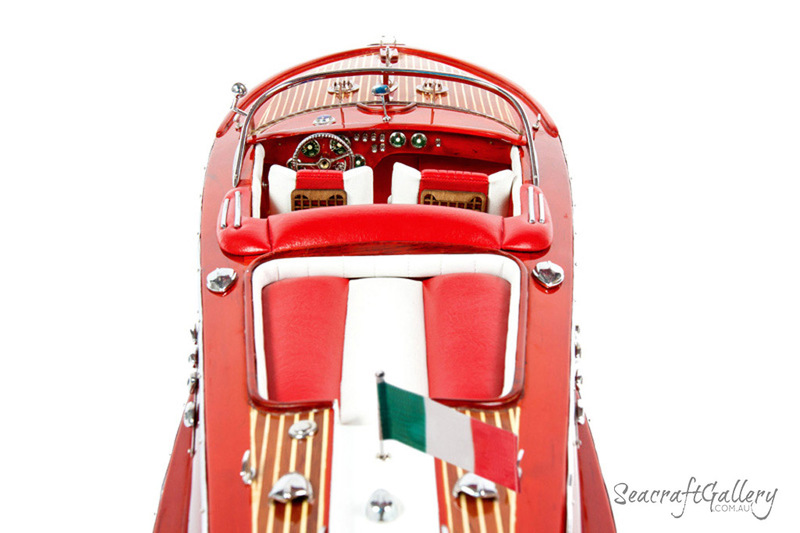 Add in its charismatic wrap-around windshield, and for a time this boat was like most Italian creations: an example to everyone. The Riva Aquarma had a hull ranging from 8.02-8.72m in size. Encased in a beautiful and enriching mahogany, she was always varnished to maintain that stylish finish. 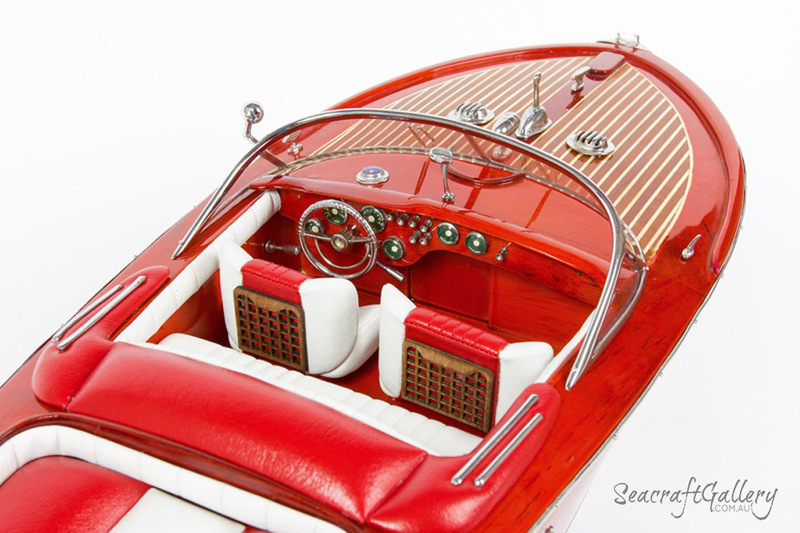 It helped the wood grain to really breathe, creating a boat that stood out from the rest. With top speeds as impressive as 50 knots, too, it was powered using a 185-400HP engine set. These were made even stronger thanks to the Riva-adjusted Cadillac and Chrysler models that helped keep this so powerful. The boat itself has had many an appearance in media and in the wider world. It was, for example, driven by Xenia Onatopp in the James Bond movie, GoldenEye, and was also seen in many other advertisements and movies throughout history. The Aquarama, today, is still found all across the seas of Europe and the rest of the world. However, today, it’s no longer as powerful as it once was, instead using diesel engines that offer less power and pace than its predecessors. Numerous model variatns existed over the years, but each one always carried that same seal of style, significance and panache that made the Riva Aquarama a true legend of modern nautical travel. 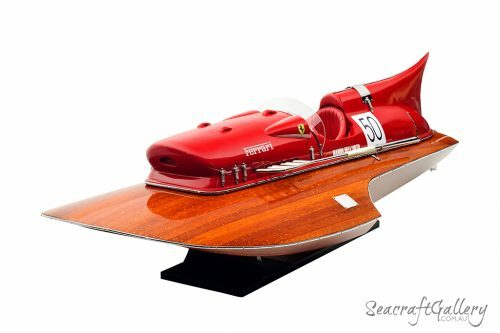 Fantastic classic wooden model with great attention to detail and high quality finish. The timber work is amazing and the chromed metal parts really finish it off. The Seacraft Gallery staff were great to deal with and I would not hesitate to use them again, cheers Paul.